AuthorMitaliPerkins: Happy International Tiger Day! I'm delighted that my novel TIGER BOY is heading for publication in India, thanks to Duckbill Press. 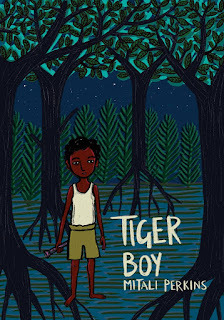 In honor of International Tiger Day, here's the almost-final cover designed by Tanvi Bhat in the traditional patachitra style of the Bengal region. Isn't it beautiful?